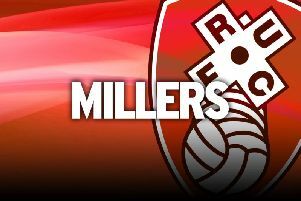 Rotherham are normally a good bet to produce the goods under the lights at the AESSEAL New York Stadium, but they lost their sparkle against Hull. Rarely have the Millers shone brighter in recent times than in a midweek evening match at the New York. But a 3-2 win for Hull left the outlook distinctly gloomy in a rare game that Paul Warne’s men were favourites for before kick-off. The Millers made a game of it in a spirited final 15 minutes when Jamie Proctor continued his dream return from injury, but boss Paul Warne will be left to rue a flat first 75 minutes. In taking the points back along the M18, Nigel Adkins’ men avoided equalling their worst start to a season since 2006-07 while Irvine continues to put his name up in lights against the Millers, taking his tally to four goals in three games against them. The Millers had made an electric start and went ahead in the 16th minute as Wood headed home Ryan Manning’s corner for his first of the season. Manning almost doubled the lead with a first-time effort that went just wide, but less than 60 seconds Hull flicked the switch. Evandro burst down the right and put in an inviting cross for Irvine to convert at the far post. Warne’s men had lost their glow and Hull went ahead on the stroke of half-time when Rodak poorly punched a cross and Campbell was allowed to roll home. It got even worse for the hosts two minutes after the restart as Irvine continued to be the Millers’ nemesis, slotting home after Campbell had nicked possession off Semi Ajayi. This Millers group will not give up, though, and made a game of it as Proctor headed home Zak Vyner’s cross just two minutes after coming on. They pushed for a leveller and were presented with a golden chance late in injury time but Ajayi somehow put a free header over the bar. That was their last flicker of hope and the Millers slipped to a third defeat from for four league games.